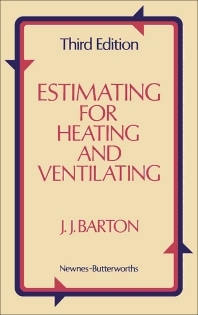 Estimating for Heating and Ventilating, Third Edition discusses various concerns regarding heating and ventilating system with an emphasis on cost estimation. The book is comprised of eight chapters that tackle a specific area in heating and ventilating systems. The first chapter tackles the principles and elements of estimating, while the second chapter deals with specifications and drawings. Chapter 3 tackles the materials involved, and Chapter 4 talks about estimating the labor requirements. Chapter 5 discusses the preparation of tender, and Chapter 6 presents notes on costing. Chapter 7 covers builder’s work, and Chapter 8 deals with the estimation of annual running cost. The book will be of great help to engineers, architects, and building administrators who are mostly involved in designing, constructing, and maintaining building systems.